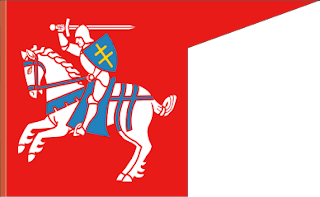 One of the earliest flags for Lithuania was a battle flag. Unique among European flags, it bears a complete figure, rather than an animal, or some part. One major battle flag carried a charging knight, known as Vytis. Then, after the French revolution, there was a pan-European movement that saw the introduction of tricolour flags all over. And, before the current colours where used, Lithuania Minor introduced its tricolour, using darker shades of green, and red, divided by white. Pushes for the use of the current colours began in the 19th century, because red, yellow, and green are all found in Lithuanian folk art. At the Grand Seimas of 1905, this banner was preferred over the Vytis banner. The major reasons being that Lithuania wanted to move away from the history of the Grand Duchy days, second, the banner is predominantly red, a colour associated with communist revolutionaries. Finally, the charging knight would be very hard to produce on a mass scale! 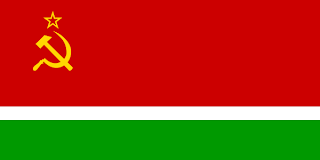 In 1917, at the Vilnius Conference, thy picked red and green as two dominant Lithuanian colours. The hall was decorated with red and green bicolour banners. However, they where deemed "too dark" and a special commission was set up to come up with a final definition of the flag. Finally, in 1918, they suggested adding a yellow stripe to the flag to represent the sun. The proposal featured the Vytis in the top corner of the flag. However, the 1922 constitution of Lithuania details the flag, and makes no mention of the Vytis symbol. And formally sets the colours of the flag as being slightly lighter than today. The flag disappeared when the Soviet Union marched back in in 1940, annexing the Baltic nations (widely condemned as illegal). 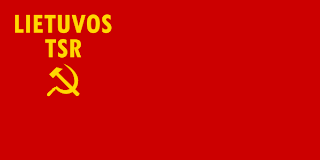 In its place, the Lithuanian SSR adopted the common Soviet red banner, with Lithuanian SSR in gold, and in Lithuanian (Lietuvos), above the hammer and sickle. In 1953, a redesign took place, this time, taking out the text, and replacing it with a green strip along the bottom. With a thin white line dividing the green and red. 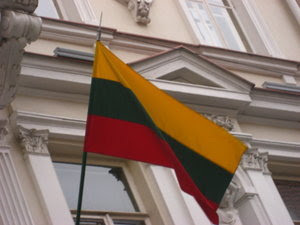 In 1988, with Glasnost sweeping the Soviet Union, the Lithuanian SSR re-adopted the Lithuanian tricolour, which was in use up to 1990, when Lithuania declared its independence from the Soviet Union.This led to the Soviet Union trying to suppress the movement, only for international recognition to begin in 1991. In 2004, the Lithuanian government finally laid into law official specifications for the flag, darkening the shades to what we see today. 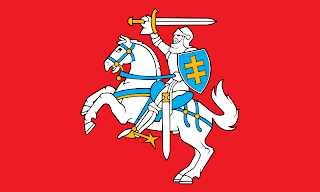 The yellow now represents the golden fields of Lithuania, the green represents the countryside, and the red represents the blood spilt for Lithuania. The law also instituted a new state flag for the nation. This time, bringing back the Vytis. This time, on a red rectangular banner. Lithuania is one of few countries that has adopted separate flags for civil and state use.